Happy Fourth of July from El Monte RV! El Monte RV wishes you and your family a happy and safe Fourth of July holiday. Celebrate our nation's birthday at any number of celebrations around the country in the comfort of a motorhome. No need to purchase expensive restaurant or vendor food or stay in pricey hotel rooms, you'll have all you need right there with you! Take a trip to one of your favorite camping destinations. Wherever the road leads you, be it the beach, mountains or a favorite fishing spot, you'll travel in comfort in an RV! 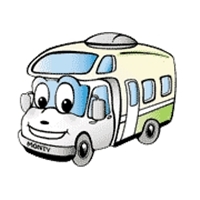 With a wide variety of vehicles to choose from, we're sure to have a motorhome that suits your needs. Make your plans now as the holiday is almost here! We make celebrating the 4th of July holiday easy, convenient and fun with nationwide locations. Check out our "Where You Can Rent" page for a location that's convenient for you. Call 888-337-2212 or book online today! RV Rental Idea: Calling all NASCAR Fans! The Coke Zero 500 race at the Daytona Int'l Speedway on July 5! The Quaker State 400 race at the Kentucky Speedway on July 11! The Sprint Cup July race at the New Hampshire Motor Speedway on July 19! The Crown Royal 400 race at the Indianapolis Motor Speedway on July 26! We make having fun easy with nationwide locations and a wide variety of motorhomes from which to choose. Our events calendar will show the races for each month. Please visit this page here. RV Vacation Ideas: Notable Road-Worthy Trips in July! These are just a sampling of the types of events that a motorhome vacation makes really enjoyable. All the comforts of home go with you, no packing and unpacking, and no lines for security! Check these out or find one on your own, but don't miss out! San Juan Island was occupied by American and British forces in 1859 as a result of a dispute over the boundary between the U.S. and the British Empire and an unusual "event". A pig from a farm ate some potatoes from a neighboring farmer's garden. The potato farmer shot the pig, which launched what is now called the "Pig War". Fortunately, no shots were fired and no one was killed, but the two sides remained in their respective camps until 1874 when the American camp was disbanded. Today, you can see the remains of these two camps at this National Historical Park. If you're staying at our featured campground of the month, drive a short 10 miles to Anacortes, WA. Motorhomes are allowed on the ferries, but it is very expensive, so we suggest parking in Anacortes and taking the ferry over to San Juan Island. Once there, there are taxis, busses provided by San Juan Transit or two seater scooters that you can rent from Susie's Mopeds to get you around. After the beautiful ferry ride to the island, there are lots of things to do. Take in all the history of the island. Other activities include hiking, blackberry picking, scavenging for sea shells, boating and kayaking, and bird/wildlife watching. The closest El Monte RV rental location is in Ferndale, WA. However, if starting your trip from another location is more convenient, we also have many other rental offices, so please visit our locations map to find a location that may be more suitable. This month, our featured campground is the La Conner RV & Camping Resort! 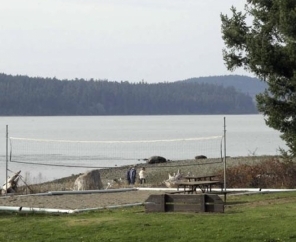 Join the La Conner RV camping site on their beautiful 111-acre RV campground in coastal Washington with 1/2 mile of saltwater beach front on Puget Sound. A short five minutes to the east is the old fishing village town of La Conner offering endless browsing of arts, crafts and antiques, distinctive dining, plus interesting historical buildings. To the west of this RV campground lie the San Juan Islands (accessible by boat or nearby ferry). 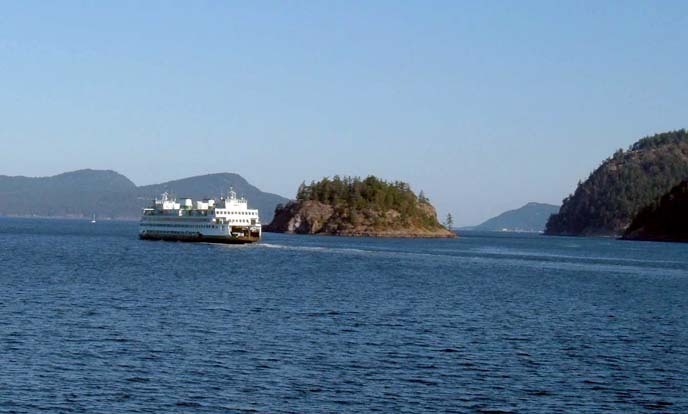 To the north lies Canada, accessible on I-5 or by ferry out of Anacortes just 10 miles northwest. Amenities at this RV campground include horseshoes, volleyball, basketball, mini golf, hot tub, shuffleboard, hiking and bike trails, billiards, wi-fi and much more. La Conner RV camping sites are conveniently located for all that you want to explore and discover in the Pacific Northwest. Visit them year-round at their coastal RV campground in Washington's beautiful outdoors. El Monte RV customers will enjoy a 10% discount off the nightly campground rate! We have a location in Ferndale, WA, however you can check out our locations map for a location that may be more convenient for your rv rental. ~ Boil chicken until done. ~ Mix soups, sour cream, salsa, chiles, etc. in a mixing bowl. ~ Cut tortillas into 1" strips. ~ Butter 9x13 pan and layer the pan with tortillas, cubed or shredded cooked chicken, and sauce mixture., (2 layers total). ~ Cover and refrigerate overnight. ~ Cook at 350 degrees for 1 - 1 1/2 hours. This best selling Class A model sleeps six, comes with stove, refrigerator/freezer, microwave, generator and so much more. Looks like new! Includes warranty. We love the RV lifestyle and we hope you do too. That's why we created our Monty Perks program! 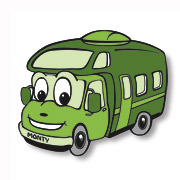 Make every rv rental count by signing up for our Monty Perks program and add valuable points with every rental. If you're not already a Monty Perks member, sign up at our member portal here. 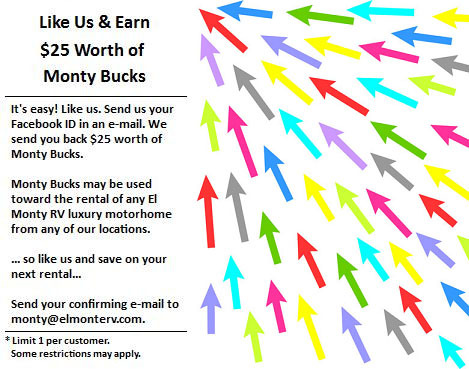 Did you know that you could earn $25 in Monty Bucks just for liking us on Facebook?!? Click the image on the right to be taken to our Facebook page. Like us. Then send your Facebook ID in an e-mail to monty@elmonterv.com. We'll send you $25 in Monty Bucks! It's Easy! We believe in Green RV'ing! El Monte RV offers customers a way to offset the carbon emissions from their motorhome vacation by requesting the carbon offset option. This option is completely voluntary and is a very nominal fee. We encourage you to consider this when booking your trip! You can request the carbon offset option when you reserve via the call center, or when picking up at the rental counter. It's easy, affordable, and every cent of this nominal fee goes straight to Terra Pass to fund various carbon-offsetting programs.